The US is not releasing any economic data but on Friday Canada announced that the inflation is lower than what they expected. After the previous high at 1.30865 the pair has been moving with bearish bias. The support lies at 1.27670 with resistance at 1.28110 which both lines are below the weekly pivot point at 1.28680. The EMA of 10 is below the EMA of 75. All indicators are showing price decline, the RSI is below the 50 level, the MACD indicator is in neutral area and the Stochastic is showing downward momentum as well. However, the decline has already passed the 61.8 of Fibonacci retracement so there might be a reversal pattern at any time soon. 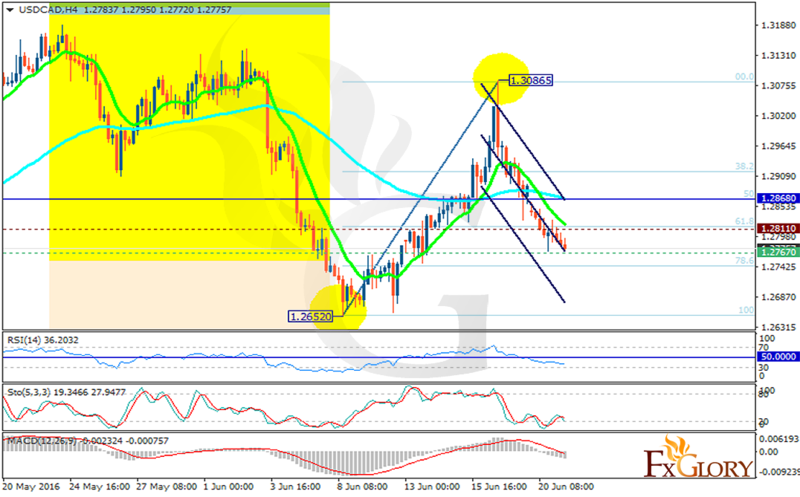 If the pair continue its downward momentum it will drop to 1.2680 but in terms of reversal it will move to 1.3100.